[prMac.com] Del Mar, California - Macphun Software, a leading photography software developer for Mac OS with over 22 million users worldwide, today is thrilled to announce the release of Lost Photos 2.0, a free Mac app that enables users to re-discover forgotten photos within their email accounts. Originally created by Space Inch, Macphun has secured worldwide publishing rights and now directs development and marketing activities for the software. Approximately 144.8 billion emails are sent and received every day across the globe, containing a treasure trove of images. Lost Photos securely scans and reveals photos stored in the email messages of most popular IMAP email accounts such as Gmail, Yahoo, Hotmail, iCloud and others. Users then preview and download photos to their Mac for viewing, archiving or sharing. The first 100 photos are free to download, while in-app purchases permit 500 photos ($1.99) and unlimited photos ($2.99) to be downloaded. "Our chief mission at Macphun is to inspire photography among Mac users around the world" said Paul Muzok, CEO & Founder of Macphun Software. "Lost Photos charmed us with its simplicity and the joy of re-discovering images we'd forgotten about. We think everyone who has ever emailed or received an image will love it," Muzok continued. Lost Photos works with these email services: Gmail, Hotmail, Yahoo!, AOL, iCloud, MobileMe/.Mac, Ymail, Rocketmail, AT&T, British Telecom Yahoo and Xtra New Zealand. Lost Photos does NOT currently work with Verizon, SBC, Comcast, BigPond or any other account not specifically listed. The app transmits data to and from email servers using the Transport Layer Security (TLS) Cryptographic protocol, employing the same encryption as Gmail and other email service providers. Lost Photos 2.0 is available for free with in-app purchases. Once installed, users get the first 100 photos from each email account for free. In-app upgrade options are available for $1.99 (USD) to get 500 photos from each email account or $2.99 to enjoy unlimited photos found in users' email accounts. 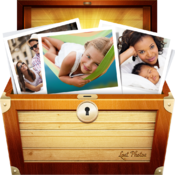 Lost Photos is available exclusively from the Mac App Store. Macphun Software develops award-winning apps for Mac OS for the consumer photography and professional digital imaging markets, serving over 22 million customers worldwide. First established in 2008 with a mission to create innovative photography software, Macphun's products such as ColorStrokes, Snapheal, Focus 2, Intensify and Fx Photo Studio are now consistently ranked among the top 15 in the paid photography category on the Mac App Store. Copyright (C) 2014 MacPhun LLC. All Rights Reserved. Apple, the Apple logo, Macintosh and Mac OS X are registered trademarks of Apple Inc. in the U.S. and/or other countries.